Important! The following article only applies to FSRM Roles that are installed on Windows Server 2003/2008/R2, as 2012 FSRM has it’s own PowerShell module! In our organization, we got users asking us to increase their Home Folder’s capacity on a daily basis. We manage these home folders on our file servers using the File Server Resource Manager (FSRM) server role. Everytime you want to set a quota limit that is managed wtih FSRM, you have to do it with the FSRM MMC, and its biggest downside, is that even when you only need to set just one quota limit, you need to wait for all the other data to load, and that can take well more than 8 or so seconds on most occasions – enough time to set quotas for multiple users through a script. Where I work, we got at least 1000 quotas on each file server, scattered around 8 file server across the country. loading all that data over WAN can sometimes be annoying. Now when it comes to setting those quotas with powershell, one possibility is to load the Fsrm.FsrmQuotaManager COM Object into the shell and use it to set Quotas. But this COM object doesn’t exists in Windows 7, only on the server itself (Server 2003 / 2008 ) and I don’t want to access the relevant file server with Remote Desktop every time I need set a quota limit… and my security team doesn’t allow me to start PS Sessions to most of our servers..
I’ve played with it, and like most .exe utilities, it’s not as syntax-friendly and easy to use as a PowerShell Cmdlet. one of the reasons is that you have to type the original path of that folder (D:\Users\James), and that can be a problem, because that path can be different from one file server to another. therefore, it’s easier for me to use a UNC. So I decided I’ll just write a Cmdlet that will pass its data to the relevent parameters of dirquota.exe. I need to know the name of the file server that is hosting the home folder. I need to know the home folder’s original path on that server. I’ll need to take this data, and populate dirquota’s appropriate parameters. For the first task, we will use Get-ADUser to store the user information in a variable. 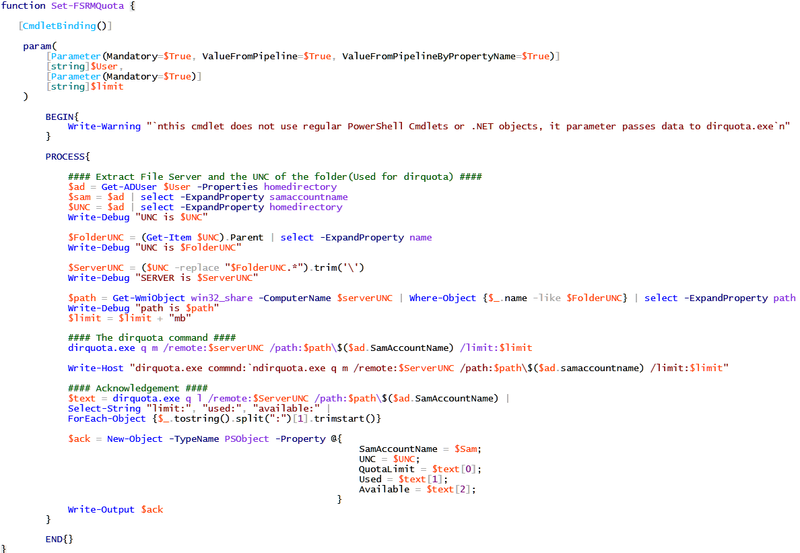 Note that im using “Select -ExpandProperty” (Select is an alias for Select-Object). I do it because I need that object as a type of string, because the original object is the type of ActiveDirectory.Management.ADUser, and it’s value is something that i cant edit, or attach to Get-Item. finally, We will put everything we wrote in an Advanced Function construct, so we can use it like we wanted to in the first place – without typing the File Server and the original path, because the file servers and the path’s can be configured and named differently from one server or user to another. This is how the final script looks like.